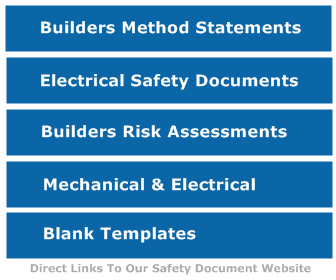 This Example Portion of our Risk Assessment covers the main Risks associated with General Electrical work, The Full Document is available HERE for instant Purchase and Download. Activity What is the Hazard? Harm:-Who or what? What are you already doing? Electric Shock All Persons Isolation Points are correctly identified.Permit to Work System. Secure isolation methods used such as lock off and signs.Ensure NO work carried out in wet area Checking for signs of damaged cables or equipment.Use of low voltage or battery powered tools. Fire All PersonsProperty Remove any existing flammable items from the work area. Fire Extinguishers to be available at the work area. Slips, Trips and Falls All Persons. Ensure that general housekeeping is carried out, trailing cables tidied.Ensure that the correct foot ware is worn.Warning signs set up where required especially on non-removable trip hazards. Falling From Height(Scaffolding and Scaffold Towers) All Persons Inspecting Scaffolding before use.Ensuring Handrails are secure.Airbags and netting where practicable. Falls from Ladders All Persons Ladders to be a last resort, and to be used for short durations only. Correct ladders used at all times. Ensure ladders are secured and at correct angle.